A created political farce played out with the frightening consequences for war against Venezuela resting in the balance on its border with Colombia this weekend, as the Trump Administration unsuccessfully tried to force the first of $20 million of unsolicited “humanitarian aid” into the country. This had nothing to do with concern for the Venezuelan people and everything to do with undermining the legitimate government of Venezuela. It should be called the food as a weapon campaign. Meanwhile teachers in Oakland California who are going into their 4th day of a strike could really use that wasted money to shore up the attack going on against education in their city and the entire U.S. for that matter. The will to make quality education accessible in this country has long since left the station but under Trump and his Secretary of the Department of Education, Betsy DeVos, champion of the for profit charter school system, the decline has become precipitous. California, the richest state in the country, has been little or no help in coming up with a plan for the crisis. In my estimation public school teachers, entrusted to teach all our children to become critical thinkers, are the hardest working and most underappreciated group anywhere, working in a system that neglects them and sets them and their students up for failure. In the last couple of years teachers’ strikes have emerged as energizing and leading the way for all of organized labor. There have been teachers’ strikes, with varying degrees of success, in a number of states including West Virginia, Oklahoma, Kentucky, Colorado, Illinois and most recently in Los Angeles. Their demands follow a similar pattern. Most of them call for a pay increase for teachers who have notoriously been underpaid and undervalued. 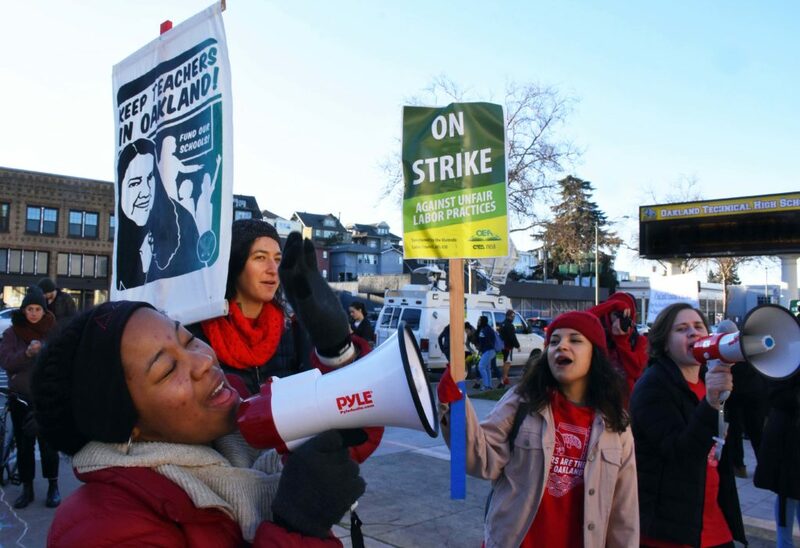 In the Oakland strike teachers are asking for a 12% pay raise over three years, hardly a greedy demand seeing that represents a 4% yearly raise or just about enough to keep up with inflation and cost of living. Oakland educators are the lowest paid in the Bay Area, where rents have risen 40 to 50 percent since 2012. The skyrocketing costs of housing have caused more than 18% of teachers to leave the district each year, including 600 last year. I am not an economist but If Jeff Bezos and Amazon was ever forced to pay taxes I would think that could pay for a 15% or a more deserved 20% raise for all 3.2 million public school teachers in the United States per year. Why not? But in all these strikes pay raises has been only one demand while most of them were about safety issues and quality of education in the class room. The demand for smaller class room sizes and more resources is across the board and in Oakland the Oakland Unified School District (OUSD) looks to exacerbate the problem by proposing to close 24 of the 87 public schools that would mostly impact Black and Latino communities. Another demand has been to increase support staff like nurses, counselors and school psychologists. In the OUSD there are 22 nurses for the 36,000 students in the district. School food programs in many school districts in the U.S. have been cut and in some cases eliminated all together. Teachers on the picket line told me this was a concern for them with hungry children showing up to learn. In the U.S. 21% of all children live below the poverty line and are food insecure. Teachers are the ones who are most aware of this problem and during the strike their Oakland Education Association has helped in organizing ‘Solidarity Schools’ that are being set up in churches and public facilities so that working parents will have a place to drop their children off during the strike and they will be fed by a grass roots campaign that is raising funds for that. Wouldn’t you say that we have an education crisis when 30 million American adults can’t read above a third grade level? So instead of Trump and Congress using a fake “humanitarian crisis” to threaten countries that don’t line up and behave to the dictates of Washington, why not redirect all those millions and billions to land in our schools and communities. This article was posted on Tuesday, February 26th, 2019 at 11:49pm and is filed under Donald Trump, Education, Teachers' Strikes, United States, Venezuela.